The once-mighty Congo basin rainforest is disappearing fast. We are planting millions of trees to help local communities and stop them entering the national parks where the last wild gorillas can survive. The Congo basin is home to Earth’s second-biggest rainforest. It absorbs carbon dioxide, it holds the soil in place to stop landslides and it stops rivers filling up with silt and flooding. Now it’s threatened by illegal mining, industrial logging and palm oil plantations. The local people are desperate for building materials, food and the income timber brings. Without the roots of the trees to hold the soil in place, it’s easily washed away in the torrential rainy season. This has led to tragedy when landslides wiped out not only crops, but killed 200 villagers. This human tragedy is also deadly for gorillas. When poor farmers lose their livelihood, they’re often forced into the gorilla habitat in search of food and fuel. 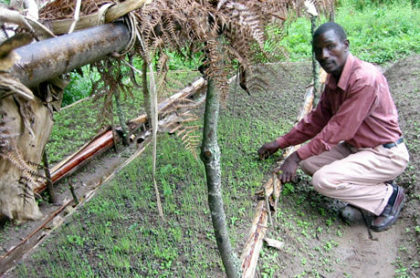 They lay traps to catch bush meat such as antelopes but these can accidently maim and kill young gorillas. They also bring human diseases into the forest that can be deadly to gorillas. With your help we can build more and more nurseries where we can grow saplings to plant and increase the size of the forest. 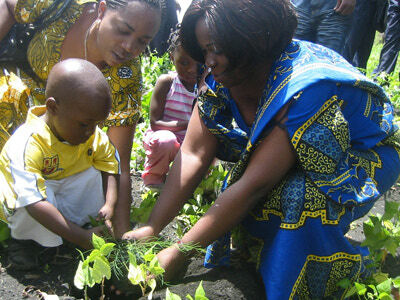 Your money would also employ more staff and tools that are needed for the planting. 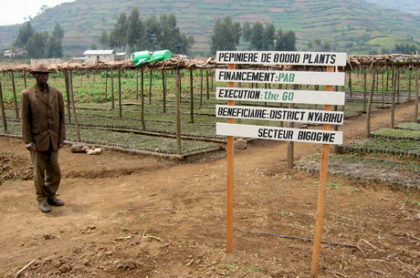 We have already helped to plant almost half a million trees in Uganda, with your help we can plant two million in the Congo too!